If you’ve been keeping up with me here, you know my husband’s favorite cuisine is Mexican, and his favorite meal is nachos. Today we’re carrying on with this scrumptious roasted poblano salsa which I’ve tried to make as close to the Carlos & Pepe’s salsa recipe as possible. This weekend we’re having a little gathering of his friends for a Mexican “food fest” of sorts. Oh, and his favorite cocktail will accompany the meal: a classic, delicious Bloody Mary! 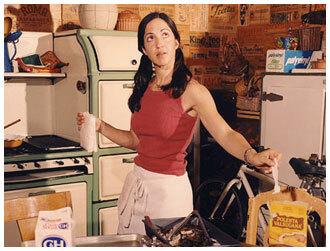 Many moons ago, my friends and I used to frequent a Santa Monica restaurant called Carlos & Pepe’s. One reason we loved it was because of the delicious chips and salsa (I guess that’s two reasons). The Carlos & Pepe’s salsa recipe was fresh, spicy, smoky, slightly sweet, and a bit crunchy. The chips were light, warm, and perfectly salted. The combination was incredible. My friend Aimée found out the “secret” to the Carlos & Pepe’s salsa recipe. The answer: almost all of the ingredients were roasted. Ahh, brilliant! So that’s exactly what I did with the ingredients in my Tomato Poblano Salsa. Our Santa Monica Carlos & Pepe’s has been gone for at least fifteen years, I think. And would you believe this recipe is my first go at my own roasted salsa!? 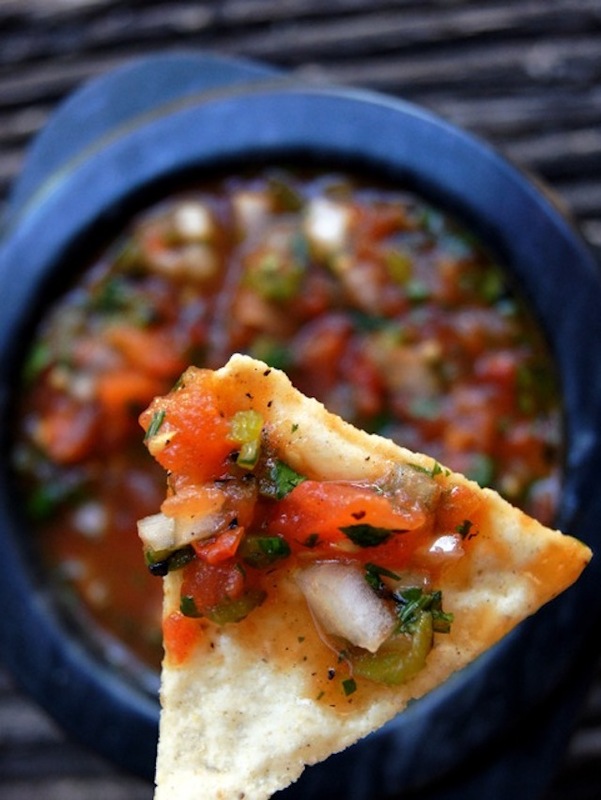 This Roasted Tomato Poblano Salsa is first up for the Mexican Food Fest this weekend! And although it’s not the original Carlos & Pepe’s salsa recipe, it’s pretty close and super delicious! The smoky flavor and fresh ingredients make this roasted salsa superb for chips, tacos, burritos, or to top meats, chicken and fish. Preheat the oven to 500 degrees F and lightly coat a baking sheet with olive oil. Sprinkle it with salt and pepper and set aside. Remove the baking sheet from the oven and let the tomatoes cool for at least 5 minutes. Turn on the broiler. Once the tomatoes are cool enough to touch, you can easily use your hands or the dull side of a paring knife to slip the skin off each half. Now you can finely chop the tomatoes and mince the garlic. Add both to a medium-sized mixing bowl. Use a spatula to scrape any brown bits of tomato, and any remaining olive oil from the baking sheet and add it to the bowl. Place the skins in a small strainer and use the back of a small spoon to drain them into the bowl as well. To roast the poblano and jalapeño peppers: Cut them in half, remove all of the seeds, and place them round side up on a foil-lined baking sheet. Place them directly under the broiler until the skin is fairly evenly charred, about 3 minutes. Remove from the broiler and then wrap them in the foil you broiled them on, leaving at least a few inches of air inside. Let them steam this way for about 5 minutes. Use your hands or the dull side of a paring knife to remove the skin. Finely chop the peeled peppers and set aside. Add the roasted, chopped peppers to the tomatoes, along with the onion, cilantro and lime juice. Season generously to taste with salt and pepper. If necessary, add a sprinkle of sugar (this will depend on the sweetness of the tomatoes). I love the look, style, writing and content of your blog. Great job, Valentina. This looks delicious!! I’m always on the lookout for salsa recipes. I am a self proclaimed Mexican food nut! My family loves it to. Which is strange because we’re Irish! We always joke that we’re part black Irish (which comes from the soldiers from the Spanish Armada washed ashore then married and whatnot) and thats why we love it so very much!! I love fresh salsa and can’t ever seem to find the “right” one! LOL!! I look forward to making this and trying it out! I have found homemade salsa far superior to any premade salsa. I like adding a little chopped chipotle chili for a smoky taste. And the best chips???? Valen I love you for creating this – I can’t wait to try it! Oh! how I remember many a lunchtime treat enjoying C & P’s delicious salsa, you could make a meal of it! What’s a brown onion? Is that the same as a yellow one? Soooooo where is the recipe? If I make this in bulk, do you think I can can it? Making tonight, can’t wait. Are the skins from either the tomato or pablano used? I peel both the tomatoes and the peppers. I prefer the texture this way, but you can try it with the skins to see how you like it. (Once you’ve charred the peppers though, you probably won’t want to add all of that char to the recipe — maybe a little.) Hope you enjoy!